Dundee University has engaged Terry Farrell for the redevelopment of its campus to the next stage. The architect, who designed Edinburgh International Conference Centre, is taking a personal role in the university project. Key buildings on the campus like the Centre for Interdisciplinary Research and the Queen Mother Building are almost finished, and work is about to start on residences and a new faculty and teaching building. Terry Farrell Architects has been retained to ensure that the redeveloped campus matches the needs and aspirations of the community. Consultation will form a big part of that process and the architect will give an open presentation on the plans to staff, students and the wider community later this month. Sir Terry has visited Dundee a number of times and is working closely with Dundee City Council and Scottish Enterprise Tayside. Sculptor and artist David Mach is developing ideas for a public work of art based on the life sciences that could be incorporated into the campus plan. 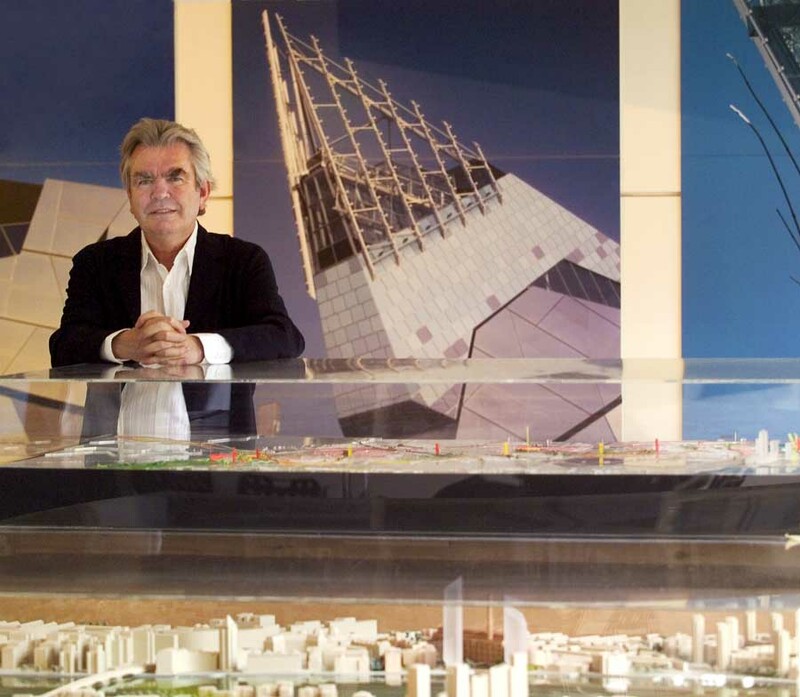 Sir Terry Farrell’s open presentation took place in the Cooper Gallery at Duncan of Jordanstone College of Art. Edinburgh’s Leith docks are set to become a mini-Manhattan, complete with Scotland’s two tallest buildings and a Guggenheim museum. Forth Ports has revealed plans to build two 35-storey towers as part of the regeneration of Leith port’s Edinburgh Harbour. The company is also in discussions with the Solomon R Guggenheim Foundation about building a museum at the port. The two towers would stretch 420 feet into the air, making them three feet taller than the Millennium Tower at Glasgow Science Centre – currently Scotland’s tallest structure. They would dwarf Scotland’s previous tallest buildings, the 31-storey flats in Bluevale Street and Whitevale Street in Glasgow’s Gallowgate, which are both 298 feet tall. March 30, 2013 in Architects.